When you want to define a color, firstly, press one of the DIY keys to enter the mode of color definition, then press the addition key or subtraction key of red, green or blue to adjust the color(the operation of pressing any keys outside of the DIY region will be away from DIY mode and the previous operation is invalid). When you press the DIY second time, the current color value will be saved. If you press the DIY key the next time, it will display color value stored recently. 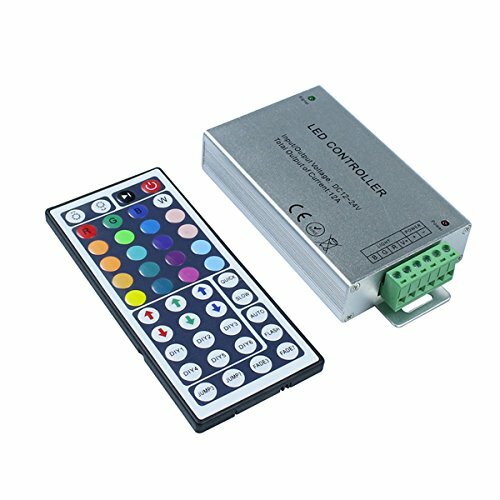 This remote control has 6 DIY keys altogether, therefore you may establish 6 colors to your likings. Each of them is independent. Could adjust brightness, static colors and various dynamic changes in lighting effects through infrared remote. If you have any questions about this product by KPBOTL, contact us by completing and submitting the form below. If you are looking for a specif part number, please include it with your message. Prestige light- Cordless LED Lighting - Showcase Paintings, Photographs & Memorabilia - Made with 10 Bright White LED Lights - Perfect for Home & Office - No Installation Required.